All in one solution – chat, audio, video, screen sharing, recording of the meetings, self-meeting rooms with static addresses as well as dynamic one-type meetings. And the ability to have a back-up/coorganizer of the meeting. This helps a lot of you’re sick and cannot open the meeting bridge for an important organizational meeting. The meeting room is being closed after 5 mins if the host gets disconnected. If it is possible to continue the meeting for 5 minutes, maybe they could just keep the meeting going till the last person goes out of the room/meeting? It is really stable and has a good audio/video quality. Simple and user friendly interface…. Simple and user friendly interface. Easy to create and join meeting sessions without training necessary and Attendees can participate without any cost, also we can use this software on trail basis of 30 days with maximum of 3 participants . lt supports Upto 100 Participants with paid version. Lacks advanced meeting options such as polling. Compatibility issues with Mac machines and sometimes Recordings are very complicated. GotoMeeting is one of the best conference call programs available as it provides incredible ease of use and an excellent set of features. Starting and joining a meeting is hassle-free; no codes or phone numbers to memorize. Features include screen sharing, HD video, a downloadable mobile app for making and taking calls on the go, and more. Audio and Video Quality with six conferencing streams and high definition video quality very nince and support service very good. Simple and user friendly interface. Easy to create and join meeting sessions without training necessary and Attendees can participate without any cost, also we can use this software on trail basis of 30 days with maximum of 3 participants . lt supports Upto 100 Participants with paid version. Lacks advanced meeting options such as polling. GotoMeeting is one of the best conference call programs available as it provides incredible ease of use and an excellent set of features. Starting and joining a meeting is hassle-free; no codes or phone numbers to memorize. Features include screen sharing, HD video, a downloadable mobile app for making and taking calls on the go, and more. It was very effective at having high-quality meetings and they seem to be integration with every which was a plus. We left because our team was growing and at the time it was costing much per user per month. We moved to another software that has the exact same features and cost lesser per user a month. Saved the company a couple grand a month. If it wasn’t for the price we would have probably stayed. It was very effective at having high-quality meetings and they seem to be integration with every which was a plus. We left because our team was growing and at the time it was costing much per user per month. We moved to another software that has the exact same features and cost lesser per user a month. Saved the company a couple grand a month. If it wasn’t for the price we would have probably stayed. Once you figure out how to use GoToMeeting properly (just spend 15 minutes reading the documentation), it is very easy to use and very reliable. I have used a variety of meeting programs and would constantly end up with no audio, mic not working, and video calls dropping despite testing everything beforehand. GoToMeeting has not given me such issues and has remained a reliable and preferable option. As with any remote meeting software, it takes a little figuring out the first time around. For instance, to change the presenter, you need to left-click on the name of the person and select the option. While this seems really simple, the UI did not make this obvious. I kept right clicking on people which would give me other options. So, buy it, and left click, and you are good to go! Once you figure out how to use GoToMeeting properly (just spend 15 minutes reading the documentation), it is very easy to use and very reliable. I have used a variety of meeting programs and would constantly end up with no audio, mic not working, and video calls dropping despite testing everything beforehand. GoToMeeting has not given me such issues and has remained a reliable and preferable option. As with any remote meeting software, it takes a little figuring out the first time around. For instance, to change the presenter, you need to left-click on the name of the person and select the option. While this seems really simple, the UI did not make this obvious. I kept right clicking on people which would give me other options. So, buy it, and left click, and you are good to go! This is very well designed software for remote meetings with audio, video, and screen sharing. I also love the companion product GoToWebinar that I’ve used for many webinars over the last several years. GoToMeeting has gained such good adoption that it has integrations everywhere with tools like Google Calendar, Chrome, Zapier, and others. We used GoToMeeting for years for internal meetings, sales calls–basically any meeting with remote participants. I’ve even used it to pull church members into my Sunday School class on weekends that are homebound because of illness. I like how you can create a persistent link that you can go to every time rather than having to set up a new link for every meeting. Just be careful if you’re having back to back meetings with the same link–otherwise, you get the next audience showing up at the tail end of the current meeting. I solved that by creating two persistent links and alternating them when I have back to back meetings. Price is right. When purchasing multiple licenses you can get the price down. It’s also very stable in almost every environment including mobile meetings so you can participate in meetings on the go. It requires a simple install that I’ve never had anyone have a problem with. It takes more bandwidth than competitors like Zoom.us for similar functionality. Chat is limited to chatting within the meeting rather than creating chat rooms inside your company for teams to collaborate on then hop on a remote meeting. It’s meant to be used every time you want to meet rather than an ongoing collaboration tool all of the time. I think they could learn something from Zoom about this. This is very well designed software for remote meetings with audio, video, and screen sharing. I also love the companion product GoToWebinar that I’ve used for many webinars over the last several years. 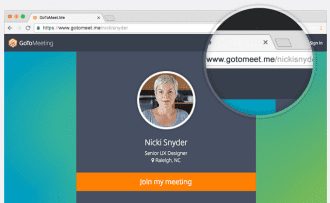 GoToMeeting has gained such good adoption that it has integrations everywhere with tools like Google Calendar, Chrome, Zapier, and others. We used GoToMeeting for years for internal meetings, sales calls–basically any meeting with remote participants. I’ve even used it to pull church members into my Sunday School class on weekends that are homebound because of illness. I like how you can create a persistent link that you can go to every time rather than having to set up a new link for every meeting. Just be careful if you’re having back to back meetings with the same link–otherwise, you get the next audience showing up at the tail end of the current meeting. I solved that by creating two persistent links and alternating them when I have back to back meetings. It’s also very stable in almost every environment including mobile meetings so you can participate in meetings on the go. It requires a simple install that I’ve never had anyone have a problem with. It takes more bandwidth than competitors like Zoom.us for similar functionality. Chat is limited to chatting within the meeting rather than creating chat rooms inside your company for teams to collaborate on then hop on a remote meeting. It’s meant to be used every time you want to meet rather than an ongoing collaboration tool all of the time. I think they could learn something from Zoom about this. Citrix, parent company of GoToMeeting, is a leader in mobile workspaces. They use cloud services to enable businesses of all sizes work better, and do more. With annual revenue in 2013 of $2.9 billion, Citrix solutions are in use at more than 330,000 organizations and by over 100 million users globally. GoToMeeting allows businesses to work anywhere. 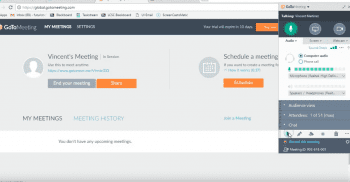 GoToMeeting Pro, $49/mo/organizer, $39/organizer/mo annual: Up to 25 Participants , Built-In Phone & VoIP Audio, Unlimited Product Updates, High-Definition Video, 24/7 Support, Recording. GoToMeeting Free: Up to 3 Participants; Instant Video Conferencing; Exclusive to Google Chrome web browser. GoToMeeting Pro, $49/mo/organizer, $39/organizer/mo annual: Up to 25 Participants; Built-In Phone & VoIP Audio; Unlimited Product Updates; High-Definition Video; 24/7 Support; Recording. GoToMeeting Pro+, $69/organizer/mo, $56/organizer/mo annual: Up to 100 Participants; Built-In Phone & VoIP Audio; Unlimited Product Updates; High-Definition Video; 24/7 Support; Recording. GoToWebinar 100, $99/mo/organizer, $948/yr/organizer: 100 attendees; Attendees join for free; Unlimited webinars; Includes GoToMeeting; Optional toll-free numbers; Built-in recording. GoToWebinar 500, $399/mo/organizer, $3,828/yr/organizer: 500 attendees; Attendees join for free; Unlimited webinars; Includes GoToMeeting; Optional toll-free numbers; Built-in recording. GoToWebinar 1000, $499/mo/organizer, $4,788.00/yr/organizer: 1,000 attendees; Attendees join for free; Unlimited webinars; Includes GoToMeeting; Optional toll-free numbers; Built-in recording. GoToMeeting ranked #1 Web Conferencing Service by Webconferencing-Test.com, 2013; GoToMeeting given Gold Edison Award, 2012; GoToMeeting wins SIIA CODiE Award, 2012. 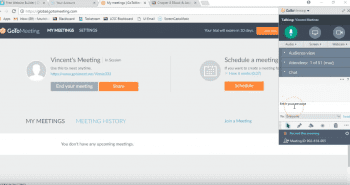 What Do You Think of GoToMeeting?